What combines frills and fashion with style and comfort? Ooh La La Couture girls dresses do. By creating comfortable clothing that lets your daughter’s personality shine through, Ooh La La Couture really designs to impress even the youngest fashionista. Their trademark tulle skirts and impeccably designed bodices will surely make your daughter the best dressed girl in town. Ooh La La Couture was created in 2004 by two moms who wanted clothing for their daughters that enveloped their personalities: fun and funky while still being sweet and girly. Their vision grows every year as they continue to come up with new princess-worthy designs suitable for everyday wear and special occasions. 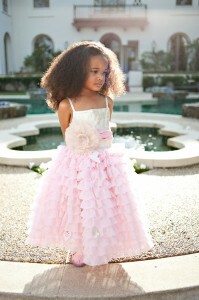 The Hollywood elite even dress their girls in Ooh La La Couture. The Ooh La La Couture girls dresses collection for 2013 does not disappoint. Your little girl will squeal with delight and she puts on the glamorous dresses with flowing layers of tulle that are just asking for her to twirl around in. The darling collection is full of all things magical and girly, including flowers, sparkles, and even Swarovski crystals. When wearing a dress by Ooh La La Couture, your sweet girl will definitely be the star of the show whether you are going to the grocery store or a birthday party. Your little girl will feel like the belle of the ball when she wears this dainty gown adorned with real Swarovski crystals. This Ooh La La Couture hi low dress will inspire her to spin around with delight thanks to its beautifully-draped layers of fluffy tulle that would make any prima ballerina jealous. This perfect dress is available in three colors: pink, black, and ivory. When your little girl puts on this dainty dress by Ooh La La Couture, she will instantly become sweeter and more precious. The layers of pink tulle under the skirt give this dress a princess-like appearance, while the white tulle roses on the top are truly divine. Make sure to get the camera ready because you will not want to forget how beautiful your daughter looks in this dress. This Ooh La La Couture tutu dress combines sugar and spice to create the perfect little girls dress. The shimmering bodice with the white heart shape and black background is sure to put stars in your daughter’s eyes. The tutu continues the sweetheart vibe with its perfect draping of sparkling white tulle. Any girl will feel like a princess while wearing this dress. >Girls’ and tween clothing manufacturer Ooh! La La! Couture of Port Jefferson, N.Y., helped launch a “Tutus 4 Tots” giveaway this holiday season at Farnsworth Park in Altadena, Calif. Held in collaboration with Toys for Tots and Family 1st, Tutus 4 Tots presented a dress to hundreds of underprivileged girls, courtesy of Ooh! La La! Couture. Following the annual Toys for Tots toy distribution, female recipients were led to an auditorium filled with dresses, where tween celebs were on hand to greet them. Celeb participants included Ana Maria Perez De Tagle of “Fame” and “Camp Rock,” Emily Grace Reaves of “Hannah Montana: The Movie” and “The Noie & Ems Show,” Madison De La Garza of “Desperate Housewives,” 2010 Miss California USA Nicole Johnson, Madison Beaty of “The Curious Case of Benjamin Button,” Allisyn Arm of “Sonny with a Chance,” Keana Texeira of “Soulstice” and Tachina Arnold of “Everybody Hates Chris,” among others. Each girl received a gift bag filled with Pink Pewter headbands, LipSmacker, Estee Lauder C-Thru Perfume, Urban Decay Hard Candy makeup, Emi-Jay hair ties, Amethyst Jeans tote, Kooky pens, Mel Lim Joy notepads and more. SHOP OOH! LA LA COUTURE NOW!